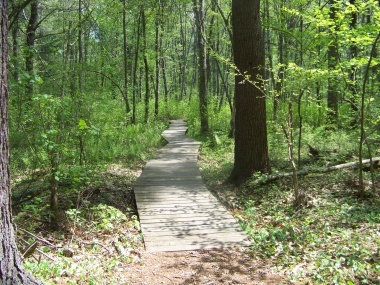 Willow Brook Farm Preserve and it's hiking trails are a Wildlands Trust property. It contains 127.2 acres of former farm lands and forested areas that were donated by several contributors to it's current size. 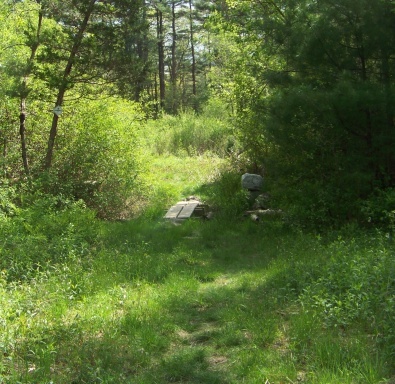 The property has several different habitats that make it a very interesting place to explore! 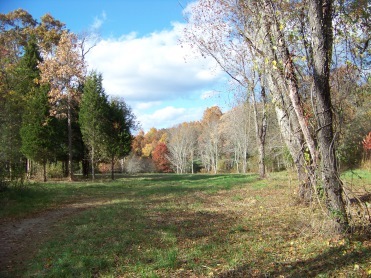 The property consisting of this preserve had several previous owners. Some of the more interesting owners were....In 1810 Benjamin Barker, with a 14 room homestead on the property, no doubt of the original Barker family that helped settle this town. This structure stood here til 1915 when it burned. Some of the remains of that building can still be found on the property. A dairy farm existed on the property in 1919, but that burned as well. 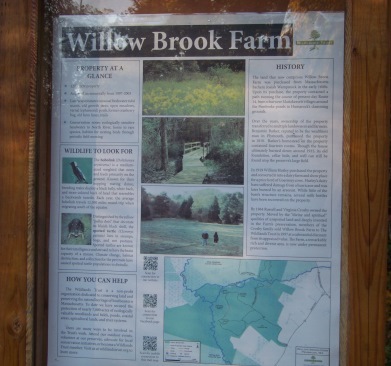 Willow brook farm hiking trails are a pleasant mix of gravel roads, woodland cart paths, and intimate trails that run through wetland, along stone walls over streams and through meadows and large open fields. The information on the Wildlands Trust page about the property speaks of a 2 mile loop that culminates at the observation tower. 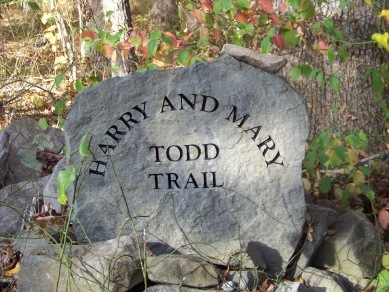 There is an additional one mile "lollypop" trail, named the Harry and Mary Todd Trail. From the parking lot on Barker St. the main trail follows a gentle downward slope along a gravel road. This road is alive with flowering vegetation in the spring and early summer months . Lily of the valley, wild rose bushes, columbines and apple blossom are just part of the fare here. The gravel soon softens to pine needle and grass but there are many rocky areas throughout the preserve. The "road " runs behind neighboring houses then connects to an older access path that looks well used in it's earlier days. One can almost see, that in days gone by, cows had been herded down this pathway onto the property! 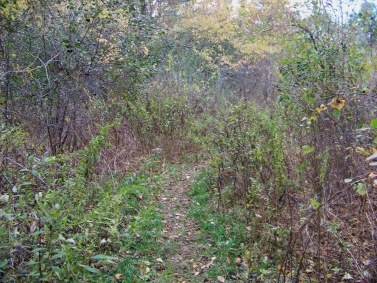 Here the trail takes a sharp left and passes through a wetland area. The kiosk at the parking area mentions a variety of spotted turtle that can be found here at Willow Brook Farm Preserve. This wetland area certainly looks to be one of it's most likely habitat. 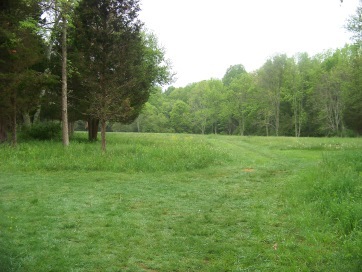 Soon the trail opens up to an open field and orchard area. At this point you will have traveled just over 1/3 mile. Two trails are seen from here. Going to the left will bring you directly down to the observation tower at the edge of a freshwater tidal marsh. Here many birds can be viewed. If you sit at the top of the tower the chance at sighting a blue heron is fairly great. I have seen one twice at this location, but never when I have a camera!! At the field, to the right, will be a bench and through the center of the field a well worn trail in the grass. Following this path down midway where some trees divide the field, other trails emerge. At this point you will have traveled just short of 1/2 mile. The hiking trail going to the right will be marked by Wildlands Trust's diamond shaped markers. 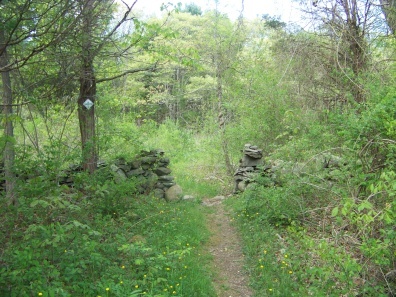 This is the start of the "lollypop" which makes up the Harry and Mary Todd Trail. 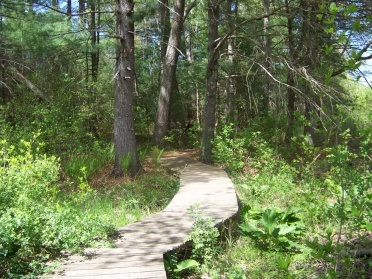 This trail winds through woodland, over boardwalks and through fields. It first passes over Pudding Brook before entering the field portion. The start of this loop passes through a stone wall. It is cart path sized and root filled but becomes easier to navigate as shortly down the trail one of the many boardwalks in the preserve begins. 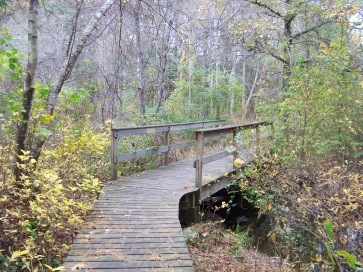 The boardwalks in this area pass over wetland. 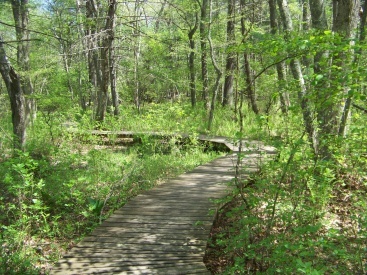 After the first boardwalk portion, the hiking trail follows shortly over land again. Then an intersection is found and another boardwalk follows to the right. the bridge over Pudding Brook. woodland that resembles an island. Here you will find yourself at another intersection. The hiking trail markers can be found either way as you are now at the loop section. 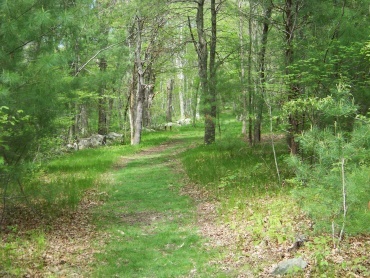 Following the markers to the left, the trail runs along Pudding Brook which soon flows into the marsh. There is an interesting area to the right where it looks to possibility have been a manmade pool in earlier days. Shortly afterward an unmarked trail will lead off to the left. If followed it will soon become obvious that this is not part of the preserve property. It is not as well maintained as the Willow Brook Farm preserve. 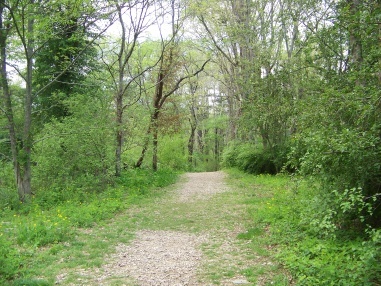 This is an access hiking trail that leads to the Town of Pembroke conservation property named Misty Meadows. It winds through this meadow. In the fall it can be almost enchanting. loops around and passes through the same stone wall further south. 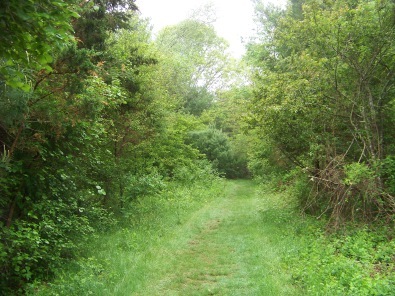 It continues to follow through meadow lined by forest and loop back to the boardwalk used to access this area. 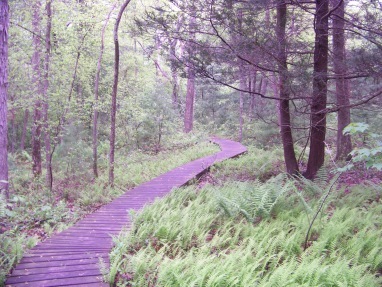 The trails follows back over the same boardwalk over Pudding Brook to where the boardwalk began. An alternate trail loop can be taken here. This hiking trail alternative goes up hill on a pine needle laden cart path. Another area to view the brook leads to the right at the top of the hill. As you descend again, views of the marsh edge come in sight to the right. Then you will return to the original large open field using the same trail and boardwalk used to come into the woodland area. At this point you will have walked over 1 1/2 miles. 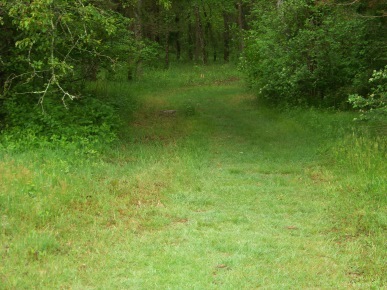 Taking a right and continuing through the rest of the field you will find an extra wide path leading into the forest. This is part of the 2 mile main loop through the property. Here I found evidence of equestrian use of the land. The trail will take a right and narrows making me believe that it will connect with the woodland loop, but then it takes a left and narrows more becoming wet and rocky. Soon it will wind around a large boulder that can make a good resting spot! You may need it as this is the 2 mile mark of this trail description! Often the trail follows along rock walls. There will be more boardwalk that will pass over a small stream that most likely will be dry in summer months. 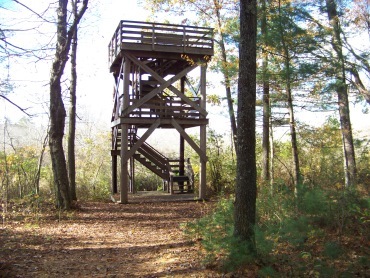 A short distance down some more trail and you find yourself at the observation tower at the edge of the marsh. There are three stories to this deck. Two small landings up to the second story deck. Then continuing on up a semi spiral stairway to the top viewing area with a circular walkway and a bench. 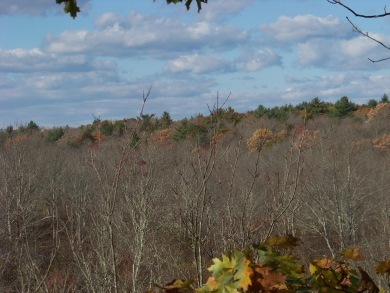 Fall view from observation tower. From the tower the trail loop takes the wide trail leading straight away from the tower. 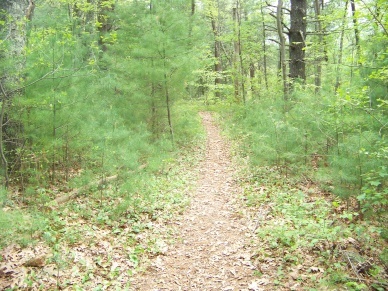 There will be a narrow trail to the right that will take you on a 1/3 mile loop through more wooded area. This trail will intersect with another narrow trail. Taking a left at this intersection completes that smaller loop. Going right will bring you to private land. 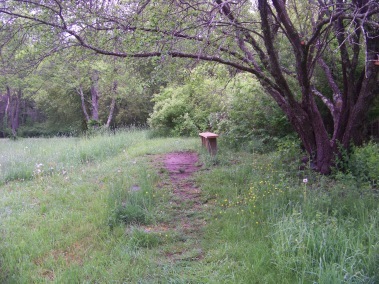 Back on the main wide trail, it soon intersects with a grassy trail that runs behind the orchard area and connects across from the Harry and Mary Todd Trail. Take a right at this intersection to complete the loop that traverses the complete property. It will go through the orchard area. This is another place where many of the birds in the preserve like to congregate. You will find yourself back at the large open field where the bench is located. Follow back up the 1/3 mile of gravel road to the parking area. The total mileage of this hiking trail description is just short of 3 miles. From Route 3 south, take exit 13 on Route 53 south. Continue on Route 53 through several lights. Approx. 4 miles entering Pembroke and continuing past intersection where route 139 exits to left, at the next set of lights take Route 14 west going right on Barker St. UNMARKED entrance is 1/2 mile down on right just after the Willow Brook Farm. stone parking lot can accomodate 6-8 vehicles.